Being able to golf in March in Myrtle Beach was a real treat considering we're still a few weeks away from golf here in the Ottawa Valley. Testing out some new apparel was great fun as well, along with Antigua's Leader Pullover I was able to test out a couple of polos from Antigua's Performance Collection. • Self fabric collar, open sleeves and solid inside back yoke & under collar. Both of these golf shirts are part of Antigua's Spring '13 PERFORMANCE-72 Collections. The Tempo polo incorporating the color Lapis (blue hue) which is one of six new colors introduced to Antigua's designs: Margarita, Apple, Melon, Phlox, and Zest being the others. Top marks to Antigua on this brighter, bolder color palette definitely will appeal to a broader market. Although it wasn't really hot in Myrtle Beach when I was there the Antigua golf shirts performed beautifully. Antigua's Desert Dry fabric technology kept me dry with great moisture wicking properties. As well these shirts were super lightweight with no restrictions to my golf swing. The Antigua Tempo Polo was the more stylish of the two polos with it's yarn dyed horizontal stripes and contrast tipped cuffs and flat knit two-color. Antigua has a shirt that all ages will like. Antigua's Desert Dry moisture management fabric gets full marks lightweight, comfortable and stylish. At $65 it's more reasonable priced with polos of the same type. 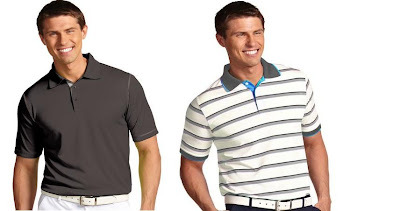 Antigua's Performance-72 (PRF-72) Golf Apparel epitomizes what golf fashion should be, fun, stylish, comfortable and affordable. Admirable polos you got here. I love playing golf with my colleagues during weekends and I'm very particular with the clothes I wear.